The Russian government is making adjustments to its 2018 FIFA World Cup budget: costs may total $20 billion. FIFA World Cup games gather a third of the world’s population in stadiums and arenas and in front of television screens. In 2018, around 2 billion people will watch the games in 11 Russian cities, since it was Russia that won the bid to host the 2018 FIFA World Cup. Now, Russia has fewer than five years to disburse 660 billion rubles ($20 billion) – the anticipated budget for the world’s biggest football event. Russia traditionally spends lavishly on the global-scale events that it hosts; this is the very nature of the expansive Russian soul. It will host the astronomically expensive 2014 Winter Olympics in Sochi, which will cost an estimated $50 billion. By comparison, the UK spent $14.3 billion on the 2012 Summer Olympics in London, against an initial cost estimate of $9.5 billion. The budget for the 2018 FIFA World Cup in Russia has every chance of breaking spending records with an impressive 660 billion rubles. Standard & Poor’s rating agency said in a report that South Africa spent “only” $6 billion on the 2010 World Cup, whereas the original estimate was $4 billion; and the 2014 World Cup in Brazil is projected to cost up to $13.6 billion, up from the original estimate of $9 billion. The Russian federal budget will inject 336 billion rubles ($10.1 billion) into the World Cup; the rest will come from regional budgets and – the government hopes – from private investors engaging in infrastructure development with hotels and other facilities. “An event of this scale is another chance to raise private investment. It would be a shame to miss such an opportunity! We must do our best to develop the tourism infrastructure in our country. The World Cup will be way ahead of the Olympics in terms of the numbers of visitors,” Prime Minister Dmitry Medvedev has been quoted as saying. The 2018 World Cup games will take place in 12 arenas in 11 Russian host-cities: Moscow, Kaliningrad, St. Petersburg, Volgograd, Kazan, Nizhny Novgorod, Samara, Saransk, Rostov-on-Don, Sochi and Yekaterinburg. The bulk of the budget will be spent on reconstruction of stadiums and construction of 12 new arenas, as well as 113 training facilities for the teams. Five arenas are currently under construction in Sochi, Kazan, Saransk, St. Petersburg and Moscow (the Spartak stadium in the Tushino district).The Kazan and Sochi arenas will be completed first and ready to be tested as early as 2013 and 2014, during the University Games and the Olympics, respectively. The government has put a 15 billion-ruble cap on construction costs for each arena. 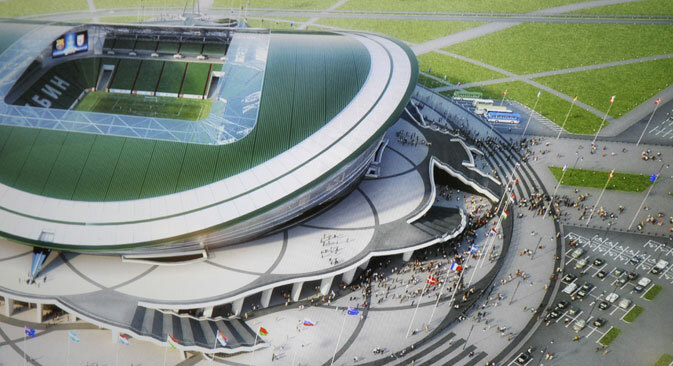 The Kazan stadium cost 14.5 billion rubles ($439.7 million). According to Russia’s Minister of Sports Vitaly Mutko, the arenas in Samara and Saransk will cost 12 billion rubles ($363.9 million) each, the venue in Volgograd will cost 15.1 billion rubles ($457.9 million), and the Yekaterinburg project will be cheaper, at 12.5 billion rubles ($379.1 million). The minister vowed to keep an eye on the budgets and added that anyone could watch the construction progress online. Construction of the New Zenit Stadium on Krestovsky Island in St. Petersburg started back in 2007, but it is this arena that the minister and tournament organizers are most concerned about. Its construction budget has been raised several times (ultimately to reach $1 billion under primary contractor Engtransstroy); the completion date has been postponed many times; however, the developer has promised to meet the final deadline, which is the middle of 2016. According to media reports, only 35 percent of construction operations have been completed so far. The new arena will have 68,000 seats, with a total capacity estimated at 84,000 spectators. The Moscow authorities are still undecided about the Luzhniki stadium in Moscow, said Mutko. There are three options for the arena, which was built back in Stalin’s time: demolition, large-scale reconstruction or a minor reconstruction. FIFA wants the old stadium demolished and a new arena built on the site, whereas the authorities wish to preserve the historical and architectural monument at least partially. Alexander Pronin, general director of OAO Luzhniki, told Gazeta.ru that the project might cost up to $1 billion; the general contractor would be named by the end of the year. Commenting on the 2018 World Cup price tag, Deputy Prime Minister Igor Shuvalov mentioned security costs, which are estimated at 30 billion rubles ($909.9 million). Furthermore, the preparation program for the 2018 World Cup envisages infrastructure improvements in the host cities. A high-speed Moscow-Kazan railway line might constitute an integral part of the World Cup project. Vladimir Yakunin, head of the Russian Railways monopoly, has said that construction would cost 928 billion rubles ($28.1 billion), of which the federal budget is supposed to provide 650 billion rubles ($19.7 billion). These impossible investments do not fit within the World Cup budget in any way. Moreover, the timeframe for the rail project has not yet been approved.